Kate Hutter takes a bow to heartfelt applause. This weekend the Los Angeles Contemporary Dance Company is celebrating their tenth year anniversary with a tribute to their founder, Kate Hutter. 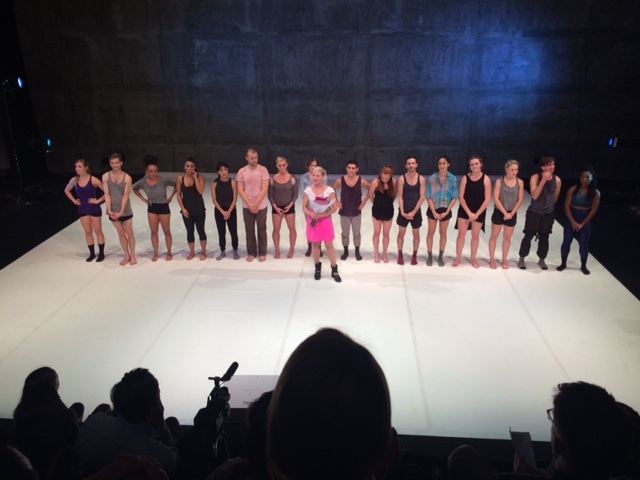 Held at the downtown LA Theater Center, last night’s performance was an opportunity for the LA dance community to honor Hutter’s vision for contemporary dance in LA, while showing selections of LACDC repertory from the past ten years. After a brief film, “Phrase,” highlighting the mission of the company, the performance began with Hutter’s Triptych from her first repertory season in 2005. Set to the motets of Josquin Des Prez, this mesmerizing piece began with six women pounding and stamping their way into the space with a steady rhythm that was immediately captivating and engaging. Hutter’s ability to weave dancers through space three dimensionally created a feeling like a ship rocking on the ocean, spilling the dancers side to side as they cascaded across each other and through the space. Sweeping and falling in grand athletic movement of lunges and dramatic shifts of weight underneath a flowing torso, the dancers were impassioned and viscerally connected to the work and each other. The energy was repeatedly scattered as the sequential gestures of the arms and spine flung the dancers through the phrases before momentarily pausing in a tableaux of feminine community. The beautiful long beige skirts seemed to glow in the lighting design by Tony Shayne. The skirts accentuated the movement not only visually, but also sonically as one could hear the material being tossed in the air and catching the wind created by the dancers’ movement. This piece was a highlight of the evening, capturing much of Hutter’s signature as a choreographer. (adjective) (noun) (verb) was a distinct shift away from the motion driven choreography of Triptych, focusing rather on character and gesture. This piece was a nonsensical mishmash of characters and costumes, set to music by John Adams. The highlight of the piece was Kim Thompson, who played a pirate shaking her finger at the audience and otherwise making a hysterical time of her performance. Thompson was charming, convincing, and physically nuanced. Her comedic timing had the audience in stiches. The only downside to this brilliant section of the work was the relative lack of spark in the rest of the piece. As a whole the piece, the work lacked coherence. Was the banana eating moment fantastic? Yes! But the conceptual weakness in connecting and disconnecting the piece weighed down the overall effect of the work. The first half closed with Unravel, which was the only piece in tonight’s show with which I was already familiar (see review here). I had seen the work in 2013 with Kate Hutter and Charlie Hodges and found it powerful, emotional and sweet. Performed tonight by Genevieve Carson and Nicholas Heitzeberg, this piece took on another layer of vulnerability and soul bearing distress. Set to music by Ezio Bosso, Unravel is a model work of the contemporary style that blends so much of modern dance vocabulary and jazz dance dynamics, forming the hybrid America has come to know as Contemporary. This work is rooted in an emotional narrative, detailed partnering, powerful athleticism and soulful connection between a male and female dancer. Carson and Heitzeberg were well matched for the piece and performed with strength and sensitivity. The second half of the show opened with another female ensemble piece, Big Skirt Woman Dance, set to a variety of music selections including Arvo Pärt, Bach, Macklemore & Ryan Lewis, and Michael Galasso. The dancers were dressed in jewel-toned skirts of contrasting colors. While this piece shared a number of aesthetic and design similarities with Triptych, this work differed with its use of a more grounded energy and more direct use of space, which had the dancers sliding across the floor as well as inverting and supporting each other in lifts. The female duet, From the Founders of Insecurity and Ego, highlighted the power required of the female dancers in LACDC. Dancers Tess Hewlett and Angel Tyson performed this 2005 duet with conviction and clarity, successfully creating a world of male power in their performance. The choice to set what I imagine was originally a male duet on two females is always an interesting choice to me. I found myself wondering- what the performance would be like tonight when it will be performed by two men? However, the thought was fleeting, as these women dominated the athletic movement vocabulary. They conveyed an intensity that resonated strongly and made the piece one of the most memorable of the evening. While I fear I might sound like a grandma complaining about the sound level twice in two weeks, the music for this piece was far too loud and despite my enjoyment of the song itself and the performance of the dancers was an uncomfortable distraction. I mention this only because this piece might very well have been one of my favorites of the evening, as it balanced the abstract with the narrative in a way that brought me into this world of ego and insecurity through the craftsmanship of the work and the unwavering performance of the dancers. The final piece Blank addressed one of the chronic issues I see in California– the fascination with “other” and our tendency to value touring companies more than local groups. Created in 2013, this piece celebrates that which is right in front of us, what is already in us. LA concert dance is rich and varied and very much alive. If we take the time to see what is right in front of us, we might have a chance at sustaining and growing this arts form and assuming our rightful place as a hub for contemporary dance that is meaningful, passionate, reflective, experimental and (gasp) entertaining! On a more personal note, Blank was a great choice as a closing work, as the whole company was able to be involved. Featuring the stories of eight core dancers, this piece gave the dancers space to be themselves and to dance for themselves and each other in a heartfelt and endearing way. I found that the more the dancers enjoyed each other on stage, the more I enjoyed their dancing. And as they joined together in motion, it seemed an appropriate goodbye to their fearless leader. In 2016 LACDC Kate Hutter will be stepping down to make way for a new Artistic Director, Genevieve Carson. The concept of a finite tenure for the artistic director had been in place since the companies founding in 2005 with the goal being a company that was not contingent on a single name or artistic vision, but rather a company that represented the city of LA. Thus, as the dancers gestured toward each other in sweet connection, Blank afforded the dancers an opportunity to honor the history behind them and celebrate the future in front of them. Performances by: Kate Andrews, Christian Beasley, Genevieve Carson, Jamila Glass, Nicholas Heitzeberg, Tess Hewlett, Marisa Jimenez, Marcello da sa Martins, Gakenia Muigai, Andrew Pearson, JM Rodriguez, Drea Sobke, Sydney Sorenson, Tiffany Sweat, Kim Thompson, and Angle Tyson.